If you've wanted to buy a new wood stove (or pellet stove or gas fireplace or just about any type of heater for that matter), we're coming up on an excellent time to buy. At the end of the season, shops need to move their inventory in order to make room for spring and summer goods, so wood stoves can be marked down significantly. For example, as I write this, Northern Tool (a big online retailer) is already having some sales on their fireplaces and stoves with sale prices running anywhere from $50 to $150 off retail. For example, the already affordable Vogelzang Frontiersman Wood Stove , which usually sells for $470 is currently on sale for $399. The US Stove Company Pellet Heater is $1499 and burns not only pellets but is "adjustable for fuels of the future" (such as corn and who knows what else we'll be burning down the road). Can a Corn Stove Save You Money on Heating Costs? Are you thinking of buying a corn stove? Perhaps a model such as this NorthStar Corn-Burning Stove ? Burning corn is nothing new. Our grandparents threw corn cobs on the fire when wood was in short supply. And today, heating with biomass (biological materials such as corn and switchgrass) is much more efficient. You can get stoves specifically designed to burn corn and do it well. But is it worth investing in a corn stove today to save money in the long run? It'll cost you about $2,000 to get a decent quality stove, so you need to consider whether long-term savings will justify the up front expense. At the end of the day, you need to look at the cost of heating with your traditional fuel and heating with alternative fuels in your area to make up your mind. The good thing is that once you do invest in a corn stove, all you need to pay in the future is for fuel and a bit for cleaning and maintenance. Many people who make the change are able to heat their whole homes--or significantly cut back on their usage of central heat--which in turn means a lot less to pay to the electric or gas company each month. If you are ready to buy a corn stove, you can get some pretty good deals online (some stores, such as Northern Tool even offer free shipping). Shopping online also gives you a lot more variety to choose from than when visiting a local fireplace and stove store, many of which may not carry corn-burning stoves. If you have easy access to wood, and you like the idea of keeping your heating bill down by using a wood burning stove as an alternative to flipping on the central heat, then purchasing one may be a good investment. You may have noticed that some models are pretty big, though, taking up a good amount of space in your room. While these can be nice because you don't have to cut the wood very small, a compact wood burning stove may be all you need (or want) for home heating. 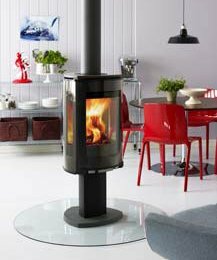 The cute little model shown here is the Drolet Compak Wood Stove, and it costs less than $500 new (a bit less than its larger cousins). It can handle logs up to 18 inches but won't stand like a hulking behemoth sticking out into your room. Another option, for those who want to minimize the space a stove takes up, is to get a wood burning stove insert. If you have an existing fireplace and chimney, then going this route makes a lot of sense. When you think of wood stoves, you probably imagine them inserted into a fireplace or perhaps taking up a corner in the living room. Well, the Norwegian Jøtul F 373 can stand anywhere and look good. I had to admit, this stove is a little too cool looking for my home, but if you're looking for a beautiful cast iron wood stove that can be admired from all sides, this may be the one! Soapstone has long been used for fireplaces, wood stoves, pizza ovens, fireplace liners, and masonry heaters because it of its natural heat retention properties. It does a great job absorbing heat while the wood is burning and then radiating it out into the room long after the fire has gone out. Soapstone is quarried like granite or marble, and it's comprised of magnesite, dolomite, chlorite, and talc. The talc makes it feel soft to the touch, so the stone feels like rubbing dry soap. 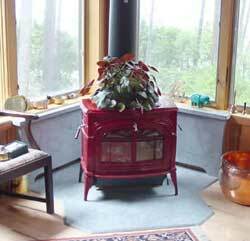 If you're looking for an energy efficient way to heat your home this winter, a wood stove made from soapstone could be a good bed. This picture is from the stove gallery over at the Vermont Marble, Granite, Slate & Soapstone Co. and you can read more about the various stone options for fireplaces and other home use. Whether you've got a wood stove or a pellet stove, you probably bought it to heat your home (people who just want a little ambiance tend to stick with traditional fireplaces). The more efficient it is at converting fuel into heat, the more money you save on your heating bills. That's why a soapstone surround can be a smart idea. As shown in the picture here, a soapstone surround captures heat otherwise lost behind the stove and radiates it back into the room. It's the same sort of a principle as a fireback; metal or stone captures and stores heat much better than brick, glass, painted drywall, etc. A soapstone surround (this stone is especially well known for its ability to retain heat and radiate it out hours after the fire has burned out) can continued to heat the room long after the fire has died down. And while the fire is burning, this method increases the amount of warmth that is sent into the home. 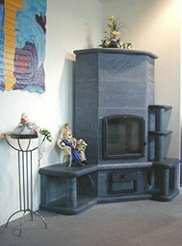 This picture is from Green Mountain Soapstone, a company that specializes in fireplace surrounds and other residential soapstone products. Cast Iron or Welded Steel Wood Stoves? So, you've decided to buy a wood stove to help lower the cost of your heating bills this winter. Congratulations. You'll have a handful of decisions to make when you're out shopping for your stove, and one of them will be choosing the type of material it's made from. Wood stoves are typically built from welded steel or cast iron. Which, you might wonder, is best? According to an article from Woodheat.org, there's no serious advantage to one material over the other. Both heat equally well, so the choice comes down to aesthetics and price. Thanks to their graceful curves and artistic relief patterns, cast iron stoves are handsome; it's just like putting a good-looking piece of furniture in your home, and if your stove is going to be a focal point (in a location where everyone will see it), you may want to go this route. Of course, you'll pay extra for looks. In addition, cast iron stoves need to be "rebuilt" every few years. This involves sealing the joints between the panels so there's no air leakage, which would allow the fire to burn out of control. Welded steel stoves don't require rebuilding, and they cost much less. The downside is that they're not nearly as pretty. If function is more important to you than fashion, there's nothing wrong with a welded steel stove. These days, there's not much difference in durability, and both will last your house for years to come. Wood-burning Stove or Wood Insert? If you're thinking of using wood to supplement your household heating this winter, you may be considering buying a wood stove or an insert. Which is better? The simple answer is that both work fine. If you have an existing fireplace, retrofit it with an insert. If you don't, buy a free-standing unit. More important than the stove vs. insert question is how much space do you need to heat? For each square foot, you'll need 25-30 BTU. For example, a 500 square foot room will need a 15,000 BTU insert or stove in order to heat it effectively. (You may also see that listed as .015 million Btu or M/Btu--it's all the same thing.) Also, check the unit's heating efficiency rating, and make sure it's above 70%. As long as you take those things into consideration, either a wood-burning stove or a wood insert will serve to keep you toasty this winter. Decide beforehand if the stove/fireplace will "drive the design of your whole room" or if it needs to "fit into the existing decor." Ask the dealer for advice before you buy, because you don't want to get a unit that's too big or small for the size room you want to heat. Especially with stoves, make sure the unit's heat output can be adjusted to keep the room from getting too hot.